Pump-action rapid fire shoots mini marshmallows over 30 feet. The easy-to-refill magazine holds 25 marshmallows or foam pellets for non-stop action. Optional laser sight. Marshmallows not included. Measures 15" long. Cleaning instructions included. 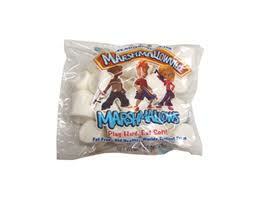 Use these regular marshmallows as ammo for the marshmallow shooters. Wage a marshmallow war! Safer than any other type of "weapon," this special shooter is outrageously fun and totally unique. Load it up with the included soft red shooting pellets or your own mini marshmallows and let 'er rip! Includes instructions and bow shooter. Easy assembly. Measures 17"L x 6"W.
Guerilla warfare has never been so sweet. 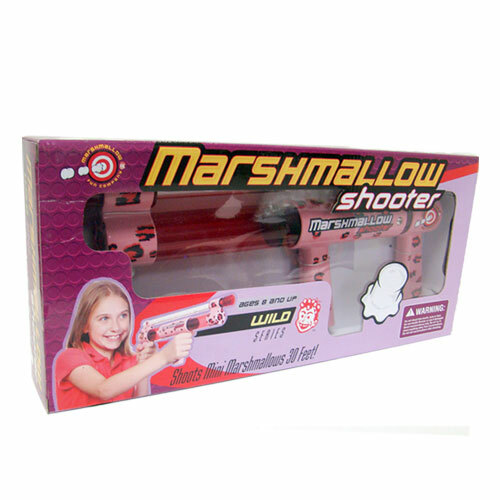 The Camo Marshmallow Shooter delivers loads of fun, firing miniature marshmallows at a range of approximately 30 feet. Hunt down the neighborhood "prey" or surprise an enemy from a camouflaged position. The Camo Marshmallow Shooter magazine holds 25 rounds of fun and is dishwasher safe. The Camo Marshmallow Shooter brings a whole new meaning to having marshmallows around the campfire. Shooter with two marshmallow Magazines for double power. Now you can double the fun! For Ages 6 & up. Blow away the neighborhood with high-powered, soft-hitting, marshmallow artillery. Use your drop-down, illuminated, cross-hair site to dial in your target. Battery-powered, micro-processor controlled, launches a large marshmallow approximately 40 feet. 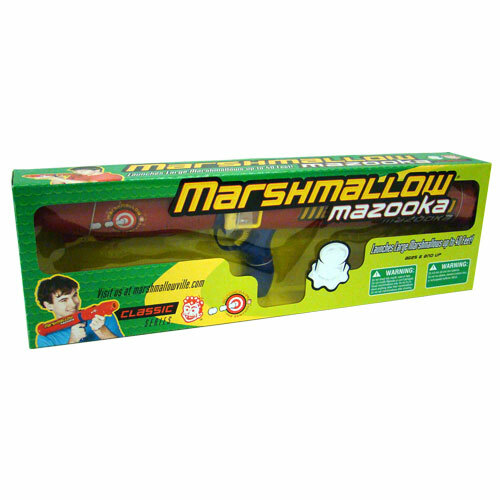 The Mazooka brings an innovative, new touch to marshmallow combat G+" where the battle is hard and the victory is sweet. The new Marshmallow Mini Bow is just like its brother the Bow and Mallow but half the size. 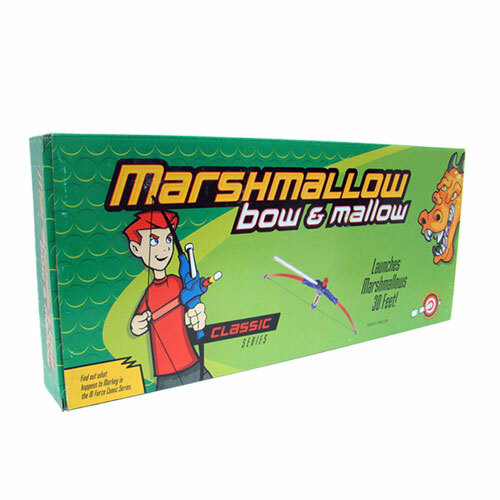 See if you're the modern day William Tell with the highly accurate Marshmallow Fun Mini Bow. Snap action fun for all ages, the Marshmallow Mini Bow shoots at a range of up to 30 feet and holds 10 miniature marshmallows in one magazine for soft, non-stop fun. 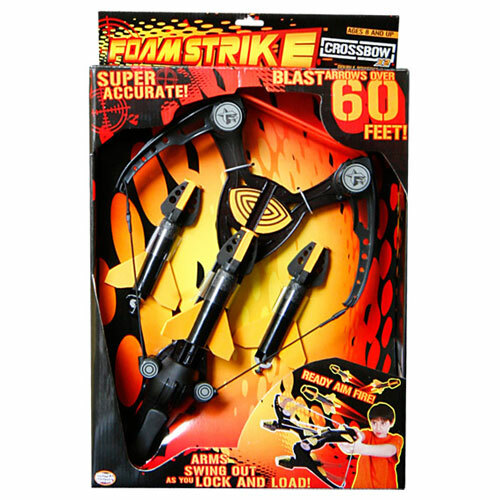 This Foam Strike Slingshot is the biggest, most powerful foam ball blaster in the Foam Strike line. With unique ammo-loading features, this slingshot is really safe and packs the power! To use this item, simply load a foam ball between the two holding pegs. Firmly grasp the handle, aim and release! You will be amazed as the balls soar over 60 feet. Each item comes with four foam ammunition balls and is suggested for ages 8 and up. 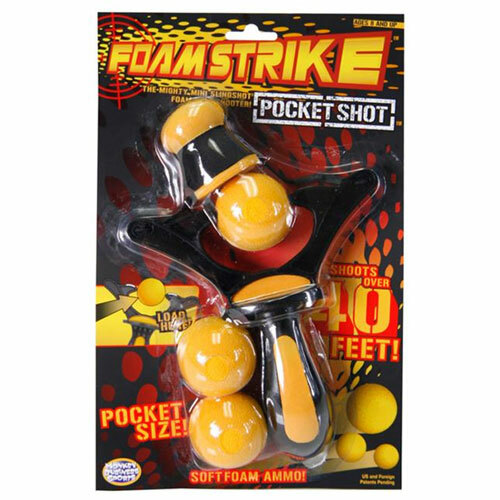 This Foam Strike Pocket Shot is like a mini-slingshot. The small size makes it great for concealing in a pocket or other small location. The Pocket Shot is super-easy to use. 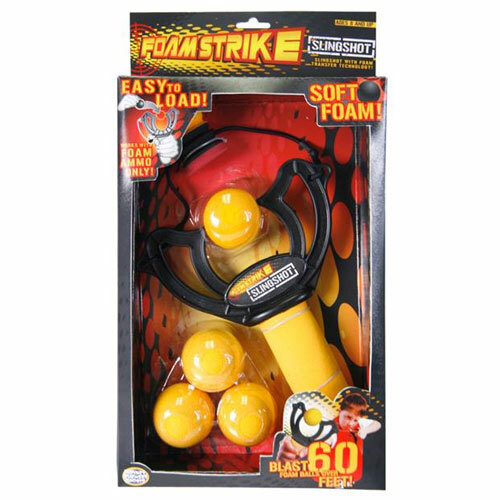 Simply load a foam ball, pull back the foam hammer and watch your ammunition fly over 40 feet! Each item comes with three foam ammunition balls and is suggested for ages 8 and up. With dual power cords and a new trigger mechanism, the Foam Strike Crossbow X2 delivers maximum distance and accuracy. The swing-action arms swing out as you load, and swing back with every fire. Once released, ammunition can fly over 60 feet. This item comes with three foam arrows and is designed for ages 8 and up. 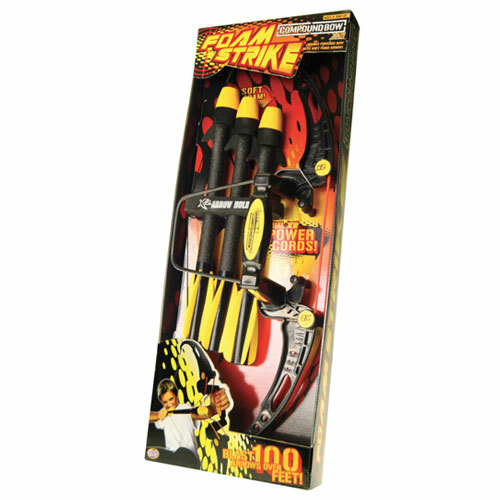 Dual power cords enable the Foam Strike Compound Bow X2 to launch foam arrows over 100 feet with accurate performance. Whether your child is right or left-handed, this compound bow is easy to use. The item includes one bow, three arrows and one arrow holder. This item is best suited for ages 8 and up. 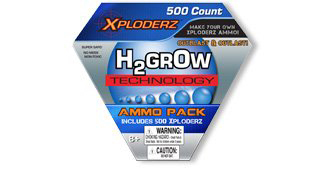 If you have an Xploderz blaster, this 500 count Ammo Refill Pack is a great way to continue the fun. Ammunition is stain-free, hydration-based and explodes on contact. Each refill kit contains enough ammo to make 500 rounds. 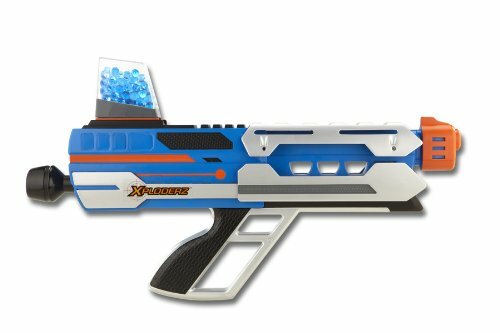 With more ammo, more distance and more power, Xploderz let you outblast and outlast your opponents. Xploderz ammo can be inserted into an ammo depot, or ammo clip (both SOLD SEPARATELY). Stock up ammunition for your next battle. Be prepared to reload and xplode faster than ever with this 500 count Ammo Refill Pack. Instructions are also included. This item is recommended for ages 8 and up. 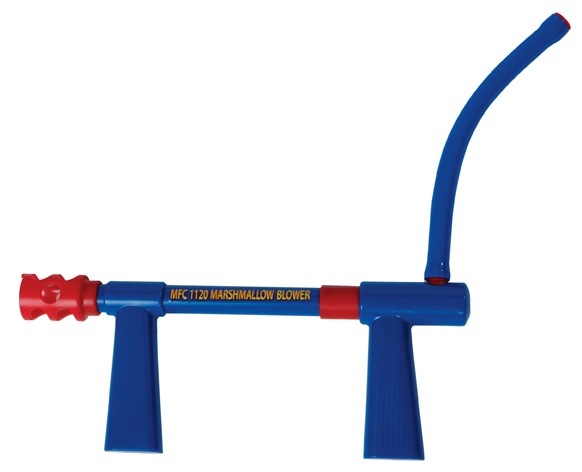 A booming success with kids of all ages, the Marshmallow Blaster shoots large marshmallows up to 30 feet on a line. 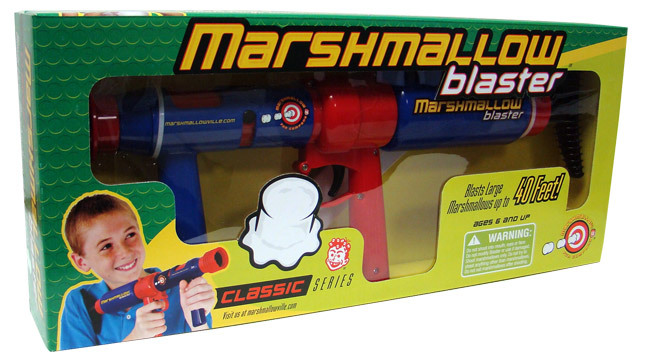 In the world of marshmallow warfare, the Blaster is one of the key weapons of marsh destruction. This single-action, lock-and-load unit fires one marshmallow at a time G+" then itG+™s time to lock and reload and continue having a blast! This safe and fun crossbow packs a wallop. 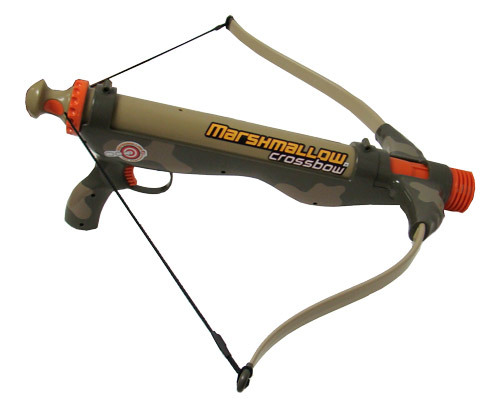 Shoot large marshmallows over 50 feet with this camouflaged crossbow. Safe and edible fun. XBlaster 200 shoots ammo up to 50 feet! Super-safe, non-toxic and mess-free, this blasterG+™s ammo clip holds 75 rounds. The ammunition is stain-free, hydration-based and explodes on contact. Kids will love growing their own ammunition, which starts out as hard little beads, but grows into a soft, gel capsule when water is added. Each item comes with one Xblaster 200, one ammo clip with 75 ready-to-fire rounds, 150 xploderz ammo refills and instructions. 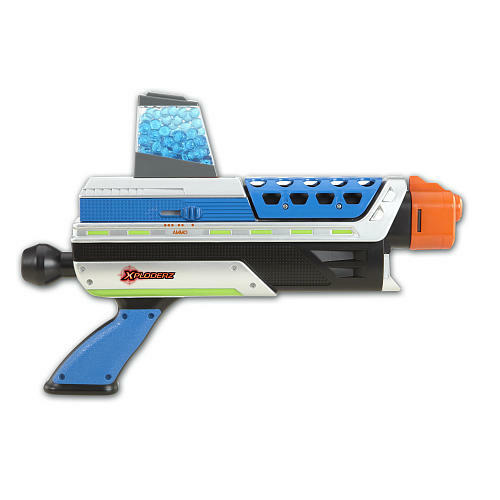 A close-range blaster with a power arm, your kids are sure to outblast and outlast any opponent with more ammo, more distance and more power. This item is recommended for ages 8 and up. Xblaster 200 is the perfect gift idea for any occasion. ItG+™s also a great toy for parties, backyard barbeques or every day fun! 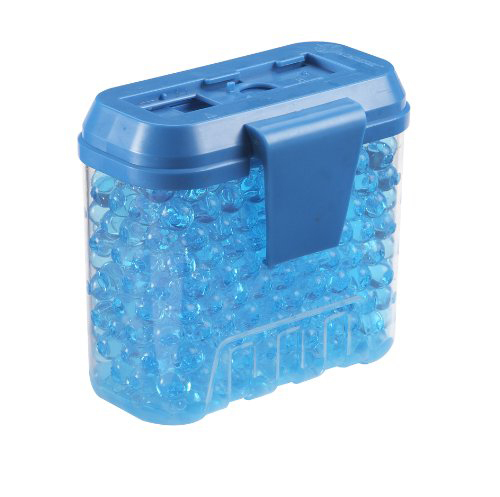 If you have an Xploderz blaster, this 1,000 count Ammo Refill Pack is a great way to continue the fun. Ammunition is stain-free, hydration-based and explodes on contact. Each refill kit contains enough ammo to make 1,000 rounds. With more ammo, more distance and more power, Xploderz let you outblast and outlast your opponents. Xploderz ammo can be inserted into an ammo depot, or ammo clip (both SOLD SEPARATELY). Stock up ammunition for your next battle. Be prepared to reload and xplode faster than ever with this 1,000 count Ammo Refill Pack. Part of the X2 Next Generation series, the X2 Mauler features a power arm and the ability to shoot up to 95 feet. Each item comes with an Xploderz ammo clip and an ammo depot that makes and holds up to 500 rounds of ammunition. 1,000 rounds of ammo are included. Kids will love growing their own ammunition, which starts out as hard little beads, but grows into a soft, gel capsule when water is added. Your kids are sure to outblast and outlast any opponent with more ammo, more distance and more power. Super-safe, non-toxic and mess-free, the ammunition is stain-free, hydration-based and explodes on contact. X2 Mauler is the perfect gift idea for any occasion. It's also a great toy for parties, backyard barbeques or every day fun! Outblast and outlast your opponents with more ammo, more distance, more power and more fun! This item is recommended for ages 8 and up. It is compatible with both Xploderz and Night Fighterz ammo. The Invader X3 shoots up to 100 feet. Super-safe, non-toxic and mess-free, this blaster's ammo clip holds 75 rounds. The ammunition is stain-free, hydration-based and explodes on contact. 150 rounds of ammo is included with each item, and we will also include an extra 500 count ammo refill kit, making the total ammunition count included 650 rounds! A hydro-chromatic target is also included with this item. The target changes color once hit and the markings disappear after five minutes so you can aim and fire again! Kids will love growing their own ammunition, which starts out as hard little beads, but grows into a soft, gel capsule when water is added. With the Invader X3, loading and exploding has never been easier. Just slide the ammo clip on the blaster and select how many rounds you want to shoot at one time. Then, release to fire. It's that easy! 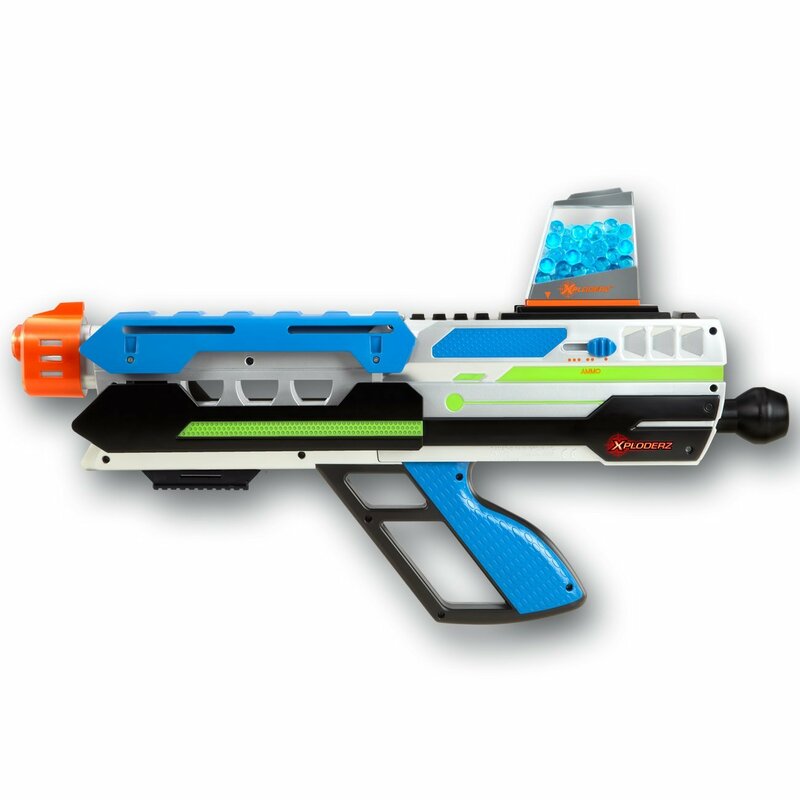 Your kids are sure to outblast and outlast any opponent with more ammo, more distance and more power. This item is recommended for ages 8 and up. The Face Off X3 shoots up to 100 feet. 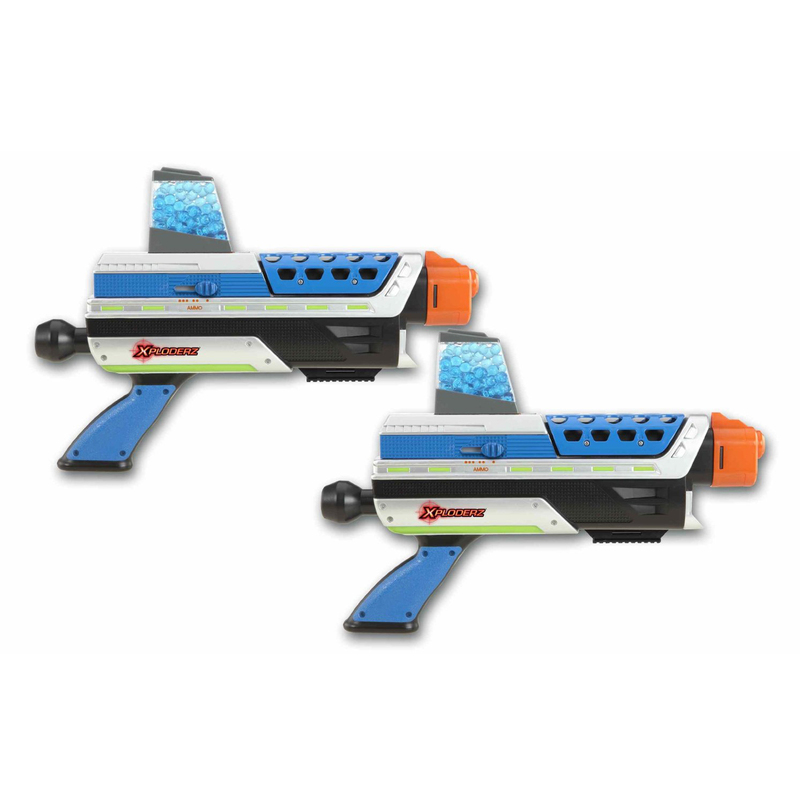 This item is ideal for families with multiple kids because there are two blasters in each pack. Super-safe, non-toxic and mess-free, the ammunition is stain-free, hydration-based and explodes on contact. A total of 300 rounds of ammo is included per set, and we will add an additional 500 count ammo refill kit, making the total ammunition count included 800 rounds! With the Face Off X3, loading and exploding has never been easier. Just slide the ammo clip on the blaster and select how many rounds you want to fire at a time. Then, pull the power arm to auto load, and the release to fire. It's that easy! The Equalizer X3 shoots over 100 feet! Super-safe, non-toxic and mess-free, this blaster's ammo clip holds 75 rounds. The ammunition is stain-free, hydration-based and explodes on contact. A total of 500 rounds of ammo is included with each item, and we will also include an extra 500 count ammo refill kit, making the total ammunition count included 1,000 rounds! With the Equalizer X3, loading and exploding has never been easier. Just slide the ammo clip on the blaster and select how many rounds you want to fire at a time. Then, pull the power arm to auto load, and the release to fire. It's that easy! Blow away the neighborhood with high-powered, soft-hitting, marshmallow artillery. Use your drop-down, illuminated, cross-hair site to dial in your target. Battery-powered, micro-processor controlled, launches a large marshmallow approximately 40 feet. 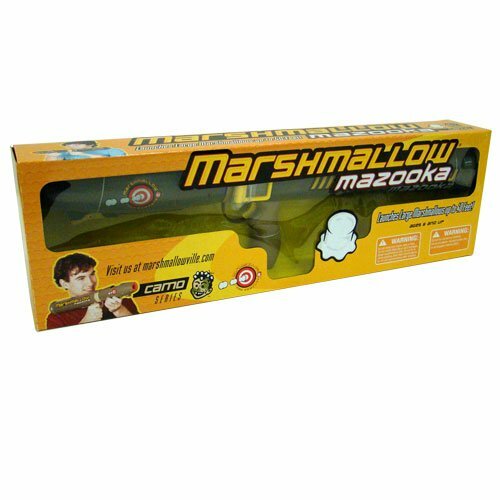 The Camo Mazooka brings an innovative, new touch to marshmallow combat where the battle is hard and the victory is sweet. Retailed packaged - perfect for selling or gift giving. Shoots large-size marshmallows (available at any grocery store!). Ammo not included. 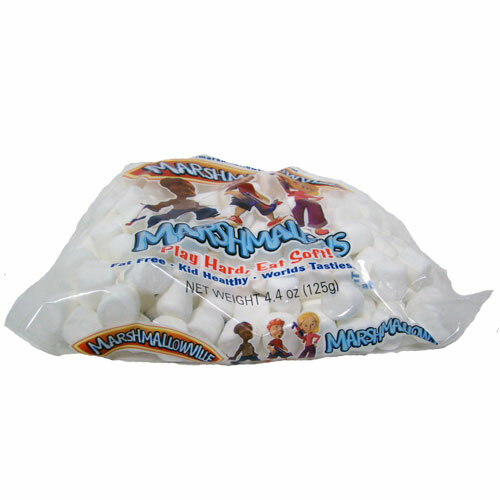 Use these miniature marshmallows as ammo for the marshmallow shooters. This clever, pump-action device fires miniature marshmallows approximately 30 feet on a line. The easy-to-fill and refill magazine holds 25 marshmallows and is top-rack, dishwasher safe to clean. Designed with kids in mind, the Marshmallow Shooter is fun for all ages and provides a soft, hearty laugh on impact. Join the party and pass the marshmallows, it's time to battle hard and play soft. 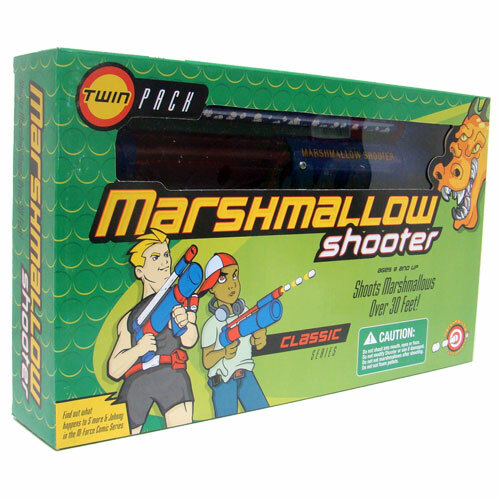 Twice the fun, this two-pack includes shooters that come ready for pump-action rapid-fire duels that pop out mini-marshmallows over 30 feet. Each easy-to-fill magazine holds 20 marshmallows. Each measures 2.5"L x 16"W x 10"H.
There are no more bored meetings when the Executive Marshmallow Shooter is the board room or around the office. 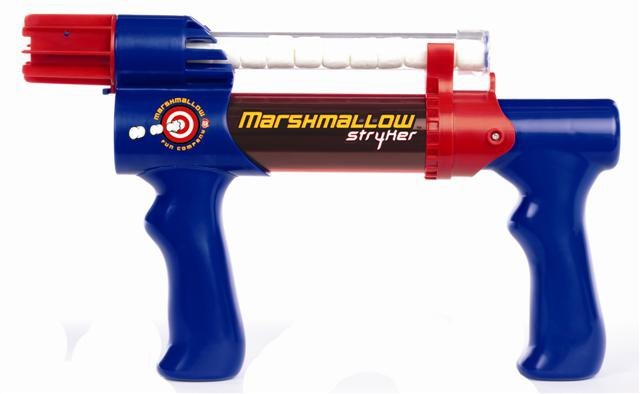 The Executive Marshmallow Shooter holds 25 miniature marshmallows in its magazine chamber and fires up to 30 feet accurately -- as long as the executives have steady hands and are straight shooters. Liven up the office and add life to the daily meetings with the fast-action, light-hearted Marshmallow Shooter - where the motto is "Work hard, play soft." The Stryker! A more compact design over the classic blue and red marshmallow shooters! Pump-action rapid fire shoots mini marshmallows up to 20 feet. Smaller body for more compact and stealth fun! The easy-to-refill magazine holds 15 marshmallows or foam pellets for non-stop action. Cleaning instructions included. Classic blue and red in color. Marshmallows SOLD SEPARATELY. 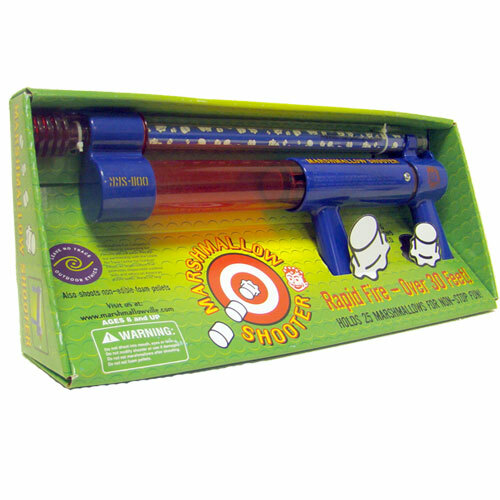 Shoot your friends jungle style with this blow-gun marshmallow shooter. Change up your battle tactics with this fun gun. 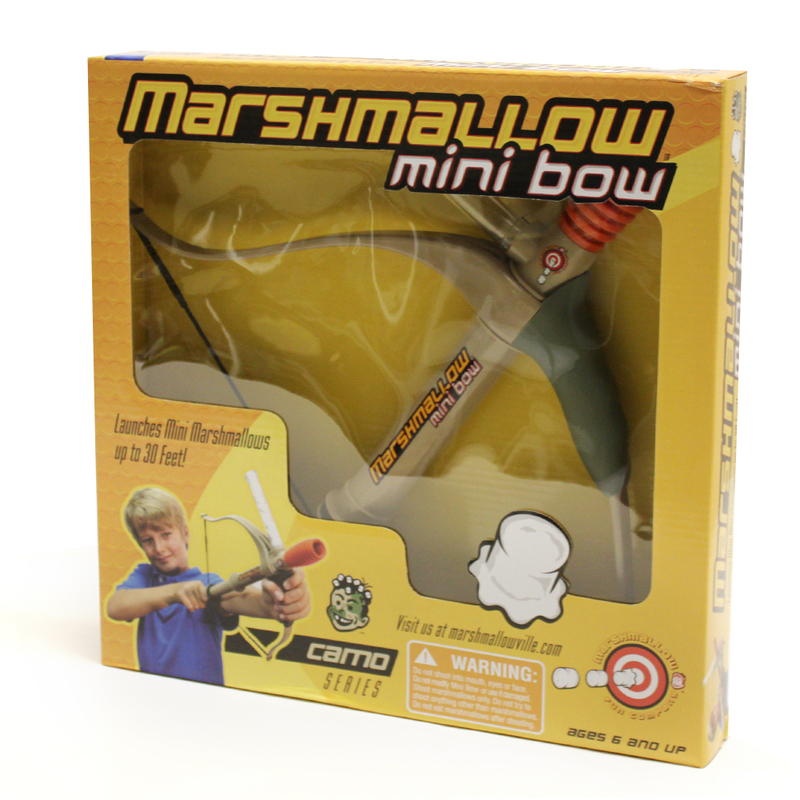 A booming success with kids of all ages, the Marshmallow Blaster shoots large marshmallows up to 30 feet on a line. 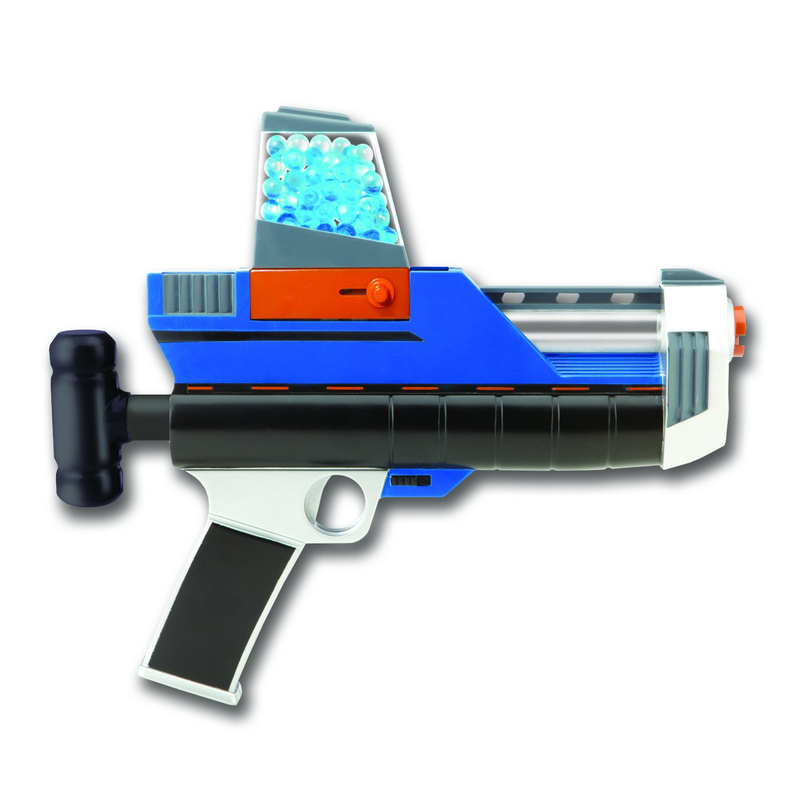 In the world of marshmallow warfare, the Blaster is one of the key weapons of marsh destruction. This single-action, lock-and-load unit fires one marshmallow at a time - then it's time to lock and reload and continue having a blast!